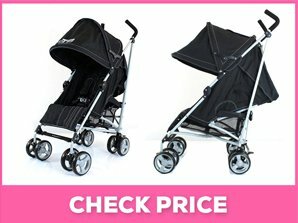 How a baby pushchair makes your life easy? 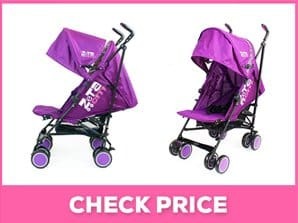 Best prams for a newborn: Right from the moment you conceive your little bundle of joy till the day they grow old enough to make their own decisions, parents and caregivers are overwhelmed by the choices that they need to make. 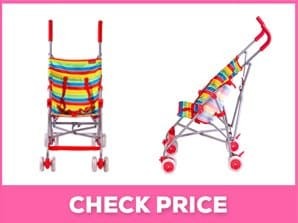 The choice of a baby pushchair is one of the first decisions you make. In the UK, it is most likely that you will not be allowed to check out of the hospital without a safe baby buggy. Who wants to take the risk anyway? As caregivers, we try our best to ensure safety in everything we choose for our little ones. A baby stroller is something that will stay with the baby for quite long and it better be comfortable. I am a babysitter and a lot of parents reach out to me for help with these decisions. While I am no expert, I have seen a lot of kids and stroller brands and thus have a fair idea of their comfort, usability, and safety. I read a lot before investing in the right baby buggy for my own little delight who came in last year as well. So, I thought I will make the choice a bit easier for you too. 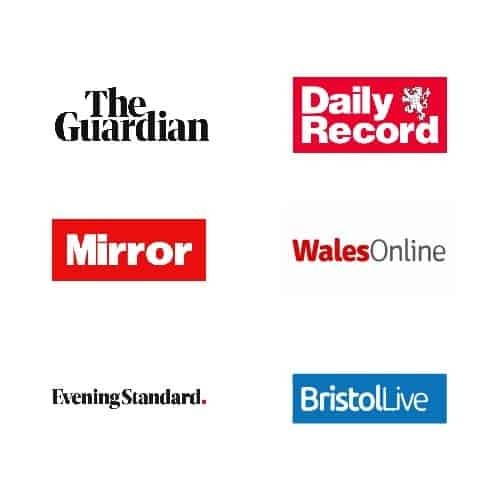 Here are the best 10 baby strollers in UK based on my research and experience and other user reviews. 3 ergonomic positions for the baby, for perfect comfort. This includes the park position, reclining position and sleeping position. 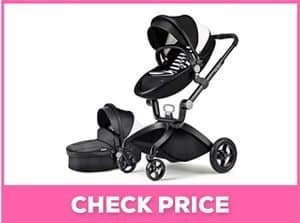 This baby pushchair is an amazing product with superior and luxurious looks and the best comfort for the baby. However, you need to shell out a significant amount for the amazing looks and comfort. For sun protection you will have to invest separately in a weather cover. Overall a highly recommended product. Strong steel tube frame makes the shopper slx robust and maneuverable. The Zero plus 0+ Car seat gives additional security to your little one with an innovative side-impact protection system, shock absorbing, 3-point belt, padded and up foamed for that extra support and comfort of your little one on every journey. Problem with wheels placements, both front and rear wheels come off easily. 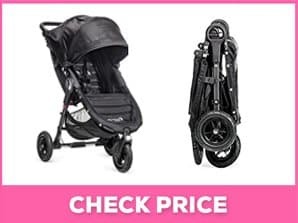 This is a very stylish lightweight baby stroller that comes bundled with all the basic accessories. If you plan to stroll mostly on paved paths, this is the perfect product. Compact and easy to fold, this is one of the sleekest looking baby pushchairs out there. The best is that you do not have to spend a lot of time installing it as it comes complete and you will just need to install the wheels. It is a lightweight and convenient product. Comes with an attractive 12 months free warranty when purchased and used from birth (Offer doesn’t stand if purchased and used for babies above 12 months). While this one is lightweight baby pushchair and easy to operate the handles may be a problem sometimes. The build quality is very strong and is perfect for those looking for single hand operation. Though one of the affordable strollers, it’s not very strong. Cannot be used on non-paved paths. Takes babies only up to 2 years of age. This is one of the most affordable baby strollers among those with reclining positions. It is a good choice if your target area is malls or tiled roads. It isn’t very strong on non-paved paths and is suitable for babies upto 2 years of age. The combination of both all-terrain wheel and front wheel suspension works together to offer you an absolute control over where and how you go while keeping your baby comfortable. Just strap with one hand and it folds itself, very simple and compact; auto-lock will lock the stroller for transportation or storage. All terrain wheel gives extra independence to move around, keeping your baby comfortable. Lot of safety concerns on this particular stroller by Baby Joggers. This one is quite handy when it comes to the operation but calls for extra expenditure on additional accessories. Many caregivers have also expressed concern about the flimsiness and safety and it is also a bit heavy as compared to others. I would suggest that if you are not looking for so much weight capacity, this baby buggy can be skipped. Padded foam handles for extra comfort when pushing your little one. Note: If the front wheel has been attached to the frame upside down, this is easily resolved by removing it and re-assembling the correct way. Replacement seat covers come with harness straps attached so these are easily replaceable as well. 5 point safety harness for the safety and security of your little one. Folds and becomes super slim to make it easier to travel with. 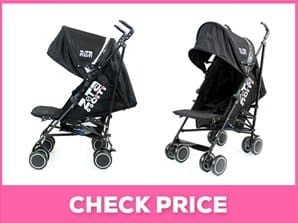 This is one of the most affordable baby pushchairs among those with reclining positions. It is a good choice if your target area is malls or tiled roads. It isn’t very strong on non-paved paths and is suitable for babies upto 2 years of age. This lightweight baby buggy is ideal only if you mean to use it sparingly. I would not recommend it if you plan to use it everyday due to its poor build and fragile quality. This baby stroller is an ideal product if you are always on the go as it is easily collapsible and effortlessly goes into the car boot. However, if you are expecting stability as much as a 4 wheeled one, you may be a bit disappointed. This isn’t much of an issue if you stroll on smooth surfaces. Overall and amazing product with perfect build quality. The city Tour's 5-inch lightweight front wheels make it easier to revolve around the daily course, can also be locked for long distance strolling. Rear parking brakes make it convenient for you to use. Fixed handle height, problematic for taller people. Wheels are very small, not meant for non-paved paths. Convenient and stylish, this baby stroller fits in a bag and is ideal for travelers. All you need to do is pack it up and send in a back pack to the boot of your car or an aircraft overhead bin. Highly recommended for frequent travelers. Safety and security: As a new parent you will most likely think to yourself that you’d not take your kid to crowded places or out on holidays to ensure their comfort and safety. 2-3 months down the line, as realization seeps in, you will know how life doesn’t stop once you have a baby and you will want to explore it, carrying them along. A baby buggy is a godsend when you are amidst a crowd, you do not have to run behind the baby and can see them safely strapped right infront of you. It is a lot safer than standing the inconvenience of being tugged around in the crowd or worse still, the fear of losing them. If you have multiple children, there cannot be anything better than a baby pushchair. I have handled a family with 3 beautiful, active kids and I know how it can be to handle multiple little ones in a crowd. An ergonomically designed baby stroller will also serve as the ideal sleeping place for your kids while you are on the go. Convenience: Trust me when I say this, your bundle of joy is not going to stay a featherweight forever. While babies love to be carried, it gets quite difficult to carry them in your arms everywhere as their weight increases. A baby pushchair is thus loads of convenience. Storage space: With a baby, you are most likely to feel like a porter, always overloaded with stuff from diapers to wipes and bottles, to extra change of clothes. With a baby buggy, you can carry all that you need with you in the storage space that comes along, without having to haul it separately in a bag all the way. Feeding made easy: Most modern baby strollers come with a detachable feeding tray, so it is easier to feed the kids on the go without worrying about the mess and having to find a place to set up a makeshift dining area. Your customized need: This one is the most important. 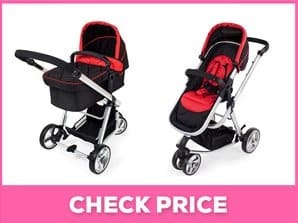 Every household is different and your choice of baby stroller will depend greatly on your purpose, the age of the baby and where you need to stroll. For instance, would you be mostly needing it for the mall or the park or while jogging? 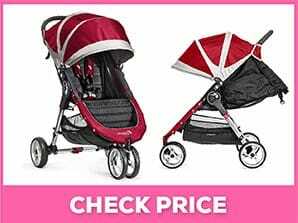 Baby strollers differ based on terrain they run on and it is important to choose the right one. My little one enjoys going out on runs with me, but I do my shopping as well with her in tow. The baby stroller I use comfortably and safely accomplishes both. You just need to choose one based on how you will use it the most. Number of kids and age: Based on how many babies you have, you can choose a double, triple or single stroller. Also, for very young babies, you can opt for a baby pushchair that can maintain a fully flat, lying down position for them. Budget: This may be one of the critical factors that define your choice. 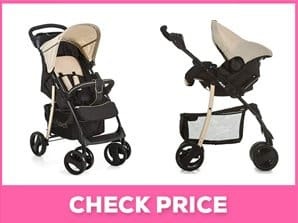 A more expensive baby stroller will generally mean more high-end features, but you must decide how much you can shell out before you shop. A baby buggy defines your baby’s comfort and safety greatly and it is extremely important to choose one that fits all the criteria of safety and your personal preferences. While the budget is a very important factor, you must not choose solely by low price as they may compromise safety. My research has taken into account all these factors, hope I was able to answer all questions. You can research based on your needs and embrace convenience along with superior comfort for the baby. Portability: This will also vary based on your needs. If you are someone who travels a lot in a car, you may need a baby buggy that fits into your boot, or a detachable car seat component. Other features: Reversible handlebars, additional food trays, weather shades etc. 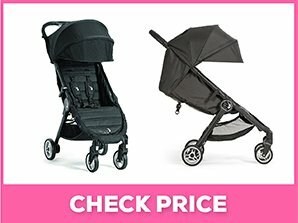 are some additional features that you may choose or skip in your choice of stroller.